POSH SPECIAL: Who’s staying and who’s going at Peterborough United? Gaby Zakuani is out of contract at the end of this season. Photo: Joe Dent/theposh.com. Peterborough United chairman Darragh MacAnthony read the riot act to his under-performing playing squad last week. It now looks inevitable there will be many changes this summer with Posh understood to have already targetted six new players for the 2016-17 season. Andrew Fox is out of contract at the end of this season. Photo: Joe Dent/theposh.com. It would be a major surprise if Stevenage midfielder Dean Parrett and Leicester City left-back Callum Elder aren’t among them, but room will have to be created by the departure of several current players. Obviously those out of contract at the end of this season are particularly vulnerable. PT Posh writer Alan Swann believes it is obvious who the club will seek to cull from the current 31-man squad. Only goalkeeper Mark Tyler of the players currently on loan at Posh, is expected to be at the club next season. Years relate to the end of the players’ current contracts, according to Peterborough Telegraph records. 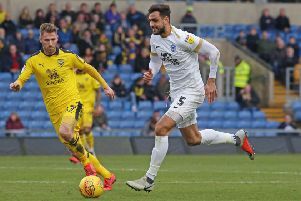 Jack Payne is expected to leave Posh for good at the end of the season. Photo: Joe Dent/theposh.com. He’ll be allowed to leave. Baldwin and Bostwick will be the preferred central defensive partnership. Posh striker Joe Gormley could leave Posh on loan in the summer. Photo: Joe Dent/theposh.com. He’s on loan at Newport right now, which suggests he isn’t wanted by Posh. Should be kept on. Steady first season in the Football League and should only improve. He wants to go so let him. On loan currently, but certain to sign a permanent contract in the summer. Will do far more coaching than playing. A decent finisher, but he’s so far out of favour, he’s certain to go. Sadly I fear the writing is on the wall for a man who has given great service to the club. If he can’t force his way into this leaky defence . . . Overall he’s done okay for Posh. Extend that contract, but also find a stronger back-up goalie. Not progressed as Posh had hoped. He could well be on his way. Club rate him so should be safe, but maybe not safe enough to get extra years on his contract. Needs a good start to next season. The talent is there so I hope he earns a longer deal. Club will try and sell him I’m sure. Gone backwards since a promising start to his Posh career. Great attitude, but he keeps making the same mistakes. I’d sell him if another club is attracted by his potential. At his best he looked a class act this season. I’d keep him, but he’s another who needs stiffer competition for his place. A big-hearted trier. If he stays fit Posh should hang on to him, but club might be tempted by reasonable offers as he enters the last year of his contract. I reckon he could still turn into the best of the current Posh strikers. There is a strong all-round player here. Hindered by a year­ out injured more than people realised and should be better with a good pre-season under his belt. Highly-rated in the game and his sale could be the one to generate transfer funds. Every team needs a player like Harry, one happy to do the donkey work. Should be kept and developed. The team’s main man. Should be kept at all costs. A captain who leads by example, although could do with some of Mick Halsall’s verbal aggression. Not seen enough of him. Next season is his important one. If he continues at the same rate of physical growth he could be the successful Academy recruit the club craves. Don’t be surprised if Posh cash in on his terrific ability and potential to improve. I hope they don’t, especially if he ends up leaving in mid-season like Conor Washington. Will be given a chance to improve after serious injury. Might be sent out on loan. Posh would sell if they could get even some of the £500k they paid for him. Recovering from a broken leg. Needs time to develop. Signs of potential. Another one with a big season ahead. Would have been sold last January, but for picking up an injury. A strong start to next season could see him targetted again. I’d sell him ahead of Forrester and Maddison if the price is right. He has the pace to be a success. Needs some expert coaching a la Washington though. The manager’s number one January signing who has hardly had a look-in. Presumably he will get his chance next season.